What would you say if we told you that you could wear an entire survival kit around your wrist? It sounds ridiculous because it takes so much equipment to survive in the wilderness! However, that's exactly why paracord bracelets are there! These bracelets, woven from strong cord and, normally, housing survival equipment, are the perfect choice for those venturing outdoors, or who simply want to be prepared. 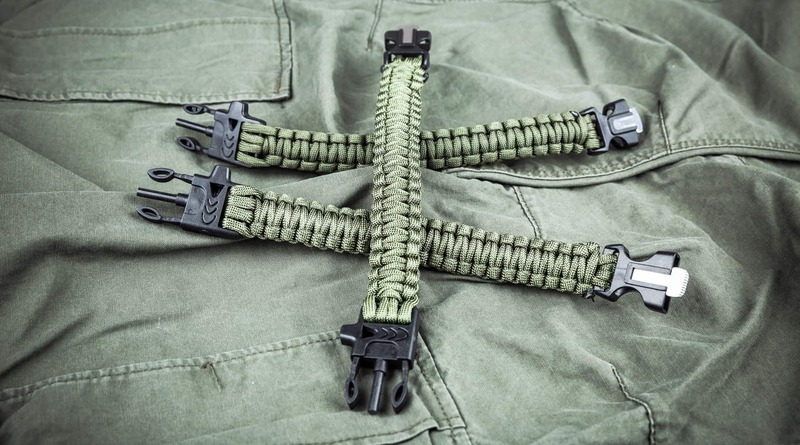 So keep reading to learn more about the best survival paracord bracelets for 201​8. What is a Survival Paracord Bracelet? What to Look For in a Survival Paracord Bracelet? 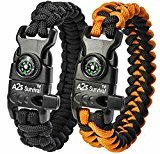 What Are Survival Paracord Bracelets Used For? The A2S Paracord Bracelet K2-Peak is an excellent choice for a paracord bracelet. It has strong cord, as well as equipment necessary for survival: a whistle, fire starter, compass, and even a knife! The Paracord Planet 550lb Type III Paracord Combo Crafting Kits with Buckles is not your average paracord bracelet. Instead of receiving a ready-made bracelet, you must make this one yourself. This means that you get to decide color, size, etc. 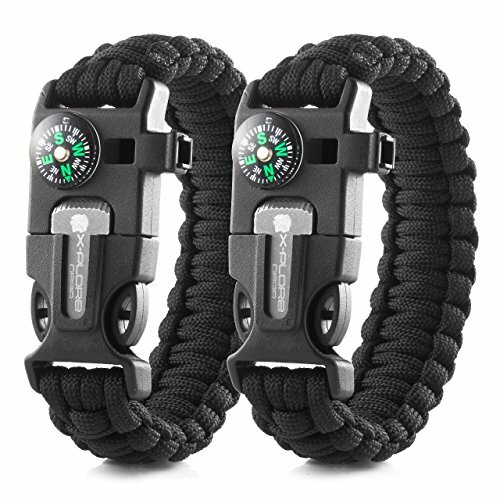 The X-Plore Gear Emergency Paracord Bracelets come with a compass, fire starter, knife, and emergency whistle. They're beautifully made, and the cord is very strong. The Friendly Swede Trilobite Extra Beefy 500 lb. Paracord Survival Bracelet comes sized large enough for even the biggest man to wear; it's wide, as well as long, making it very bulky. The clip is the strongest available, made of stainless steel. The Survival WRAPS Emergency Paracord Bracelet stands out among the others for one reason alone: the magnesium fire starter! This makes it easier to get a fire going. It also has the other equipment standard to paracord bracelets. For those who are looking for a paracord bracelet that has something for every emergency situation, you might want to consider the A2S Paracord Bracelet K2-Peak. This is a bracelet that is perfect for anyone's emergency kit. 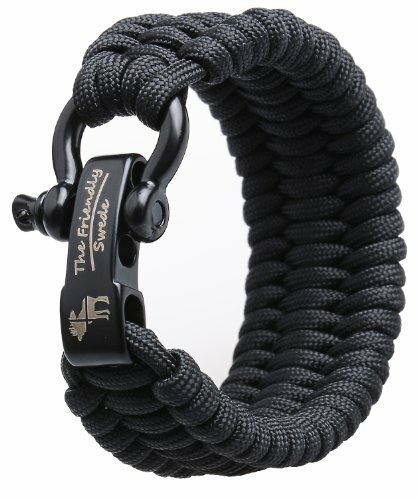 The paracord that makes up this bracelet is high quality, and able to support up to 550 pounds, or 250 kilograms. This makes it perfect for a variety of tasks: from first aid, to building shelters, or even for fishing! But there are other things that make this a good choice in paracord bracelet. It doesn't stop at the cord. You won't have to worry about wet matches with this product; it comes with a fire starter, which is a crucial piece of equipment, as fire is important in any survival circumstance. You can also avoid getting lost, because of the high-quality compass that is built into this product. For signaling for help, there is an emergency whistle; this puts out a noise at 100 dB, a very loud sound that is sure to carry to searchers. There is also an emergency knife, which is good for a great many things. The only problems reported with this product are that the sizing can be a bit big. Use caution there. ​Two bracelets per order; perfect for a gift! The Paracord Planet 550lb Type III Paracord Crafting Kit with Buckles is more than just a mouthful... it is also a handful. This isn't a traditional paracord bracelet, but a diy paracord kit, which is something to be forewarned about before purchasing this product. The best part of this product has to be the ability to get the exact style and size of paracord bracelet that you want. There are a huge variety of colors, different themed sets, and other ways to personalize your bracelet; you also get to choose exactly the size that your bracelet will be, because you'll be the one making it. Which brings us to the downsides of this product. The biggest problem with this kit is that it is, indeed, a kit. You won't receive a ready-made, ready-to-use bracelet. Instead, you'll get the cord and a buckle needed to make it. So, you must know how to make these bracelets before starting. This kit also doesn't come with any of the survival equipment that other paracord bracelets have. There is no compass, knife, fire starter, or emergency whistle. The X-Plore Gear Emergency Paracord Bracelets have the equipment that one looks for in a survival bracelet. When you order one product, you receive not one but two paracord bracelets, along with the standard fire starter, scraper, compass, and survival whistle. The cord itself is strong, as well, and perfectly suited for anything that paracord is normally used for. Sometimes the compass doesn't function when the bracelet is on the wrist. For those who find that the average paracord bracelet isn't large enough, or who simply want something a bit bulkier, the Friendly Swede Trilobite Extra Beefy 500 lb. Paracord Survival Bracelet might be the perfect choice. The biggest plus to using this product is that it is a good deal larger than most other paracord bracelets, not only in width, but in circumference. This fact alone makes it great for those who have found trouble finding bracelets to fit them. 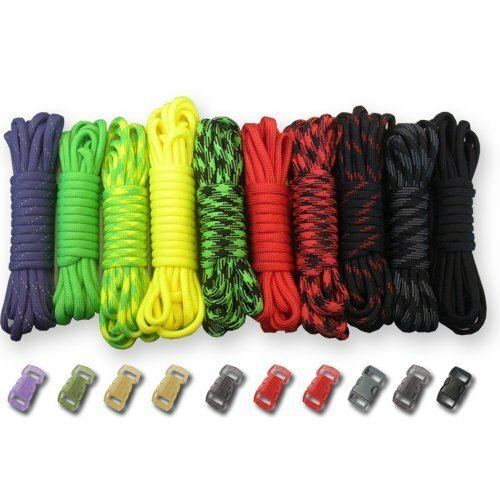 But if you are looking for a paracord bracelet that acts as a survival kit in and of itself, know that there is no fire starter available on this product; you will have to carry your own in this instance. There is also no compass, nor an emergency whistle. This is simply a product for easily transporting lengths of paracord while looking good doing so. Survival WRAPS Emergency Paracord Bracelet is your standard paracord bracelet, with a few hidden tricks up its sleeve. This makes it a good choice for those who want a better-than-average bracelet. This bracelet has the perks that you should look for in a survival bracelet: a fire starter, a compass, and a scraper that doubles as an eye knife. The only thing that it seems to lack is an emergency whistle. The fire starter that comes with this product is particularly interesting. Instead of the standard flint, this one uses magnesium, which makes it easier to get a fire started, and produces sparks even in adverse weather conditions; this is great for areas with cold climates. The compass, too, is high quality, though there have been reports of bubbles forming. The compass has been tested, and has been found to be extremely reliable. Paracord bracelets are perhaps some of the easiest survival equipment to keep on you at all times. While others require a lot of packing and planning, a paracord bracelet is simply worn around the wrist, making it simple to take along wherever you go. If you are an outdoorsy person, one of these survival bracelets should be part of the standard equipment that you carry alongside your bushcraft backpack, when venturing out into nature. The standard options that come with this accessory are great to have, in case you get lost or have to make do with what's on hand while in the great outdoors. Paracord bracelets are also a great item to keep in your vehicle, or any other survival storage area that you might have, such as your 72 hour kit. They tend to be very lightweight, and hold important tools that you'll need in the event of an emergency. Simply wearing one while traveling could mean everything. The most obvious part of a survival paracord bracelet is, of course, the paracord, from which it gets its name. Paracord, short for “parachute cord,” is a very strong, yet thin rope that is designed to hold the weight of a human, and, usually, then some. This can come in handy, allowing you to build shelters, tie up your emergency food, or even tie a tourniquet. But paracord isn't the only thing to look for in a paracord bracelet. There are other items that most bracelets come with, as well. Fire starters are always good to have on hand, particularly if you're roughing it outdoors. While regular lighters may cease to work, and matches might get wet, a good fire starter will always serve you well. Compasses, too, are a great thing to have. Too many lost hikers and campers wander around in circles; with a compass, you can easily be pointed in the proper direction. The way that the paracord bracelets are woven, you will normally receive approximately 10’-12’ of this strong cord. And it is strong, able to support, on average, up to 550 pounds of weight. This cord is useful for a great deal of things related to survival. You can use it in first aid, as a tourniquet; you can also use it to help build a shelter, should you become stranded. It makes a great way to secure your survival food off of the ground, and can be useful in rough terrain. No matter your survival situation, having paracord will help more than hurt. And, with it braided around your wrist, you'll hardly even notice it's there... until you need it. But it isn't just paracord that makes a good paracord bracelet. These bracelets should, and normally do, come with other survival necessities. Fire starters are a big plus to have in any extreme environment; fire can keep you warm, keep you safe, and cook your food. But, instead of relying on matches or lighters, many prefer the dependability of a fire starter; most paracord bracelets come with one. Compasses, too, are often overlooked when packing for a camping or hiking getaway, or even for just going to remote areas in your vehicle. But these are often necessary pieces of equipment, the kind that should definitely come along with you. These bracelets should come with a compass, to keep you headed in the right direction. There are other things that might come with a paracord bracelet. Some models have a small built-in knife, perfect for cutting the paracord to certain lengths. Some also come with emergency whistles. After carefully reviewing all five products, we believe that the absolute best survival paracord bracelet available in 2018 has to be the A2S Paracord Bracelet K2-Peak. This bracelet is truly a great choice for anyone, regardless of the reason for purchasing this product; it could mean the difference between survival and death. The fire starter that it has makes it a great choice in keeping warm, of signaling for help; the scraper doubles as a sharp knife. But it goes well beyond that. The cord itself is certainly useful, making easy any chores you might use it for, including building shelters, fishing, sewing, or even first aid. The compass and whistles are excellent touches, as well. With the compass, you'll never have to fret about being completely lost. The whistle is extremely loud, and perfect for signaling for help; anyone searching for you can't help but hear it.